This post is dedicated to Jen and Mike who had to say goodbye to someone very special last week. I have a bad habit of not realizing how much I’m going to miss a part of my life until it passes me by. I get nostalgic over everything even “bad” times, depressing times. For example, I found myself fondly remembering the time right after Emory was born where sleep had become non-existent and I was pumping breastmilk around the clock. I started to miss 3 AM pump sessions where I’d sit listening to the hum of a breast pump while reading I Can Has Cheez Burger. I was so chemically imbalanced back then, it’s amazing to me now that I can remember it so fondly. Yet I do. I can glorify even the most depressing moments of my life, the only requirement is that they are in the past, which doesn’t particularly narrow down my options. I can renovate my history no matter how beat up and ugly it may seem. Today I want to take a step back and look at a snapshot of my life 12 months ago because 12 months ago, I was about to enter a time of my life that I consider to be one of the happiest. A year ago today, we were getting ready to say goodbye to a beloved (fuzzy) family member. We were days away from being told that he had incurable cancer that had been killing him for several months. Saying goodbye to Schmitty was very, very difficult and with the anniversary of his death quickly approaching, we’ve been talking about him more than usual. We have discussed the fact that we’ll soon be leaving the last place that he ever lived. We’ve discussed that he won’t get to retire in a house like we always wanted him to. 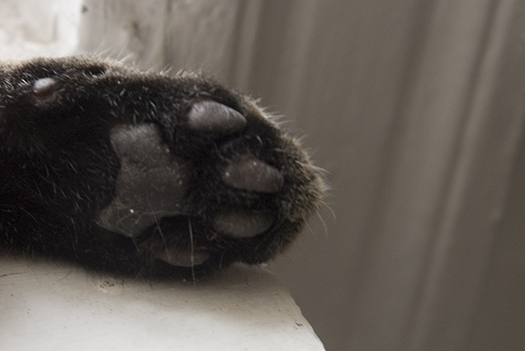 It brings me great sadness that I’ll soon walk on a floor that his paws have never touched. It bothers me that we won’t walk common ground ever again. It bothers me that we’ll be leaving behind a wall that holds his footprint and reminds us of the fact that he once used it to help him down from the windowsill. But day by day things started to look up and before I knew it, I was feeling happy in the present tense. I was six months pregnant. I was putting on weight like a champ and growing more and more immobile by the minute. I was looking forward at a very hot and potentially daunting New York City summer but that didn’t bother me. I was staring my first ever child-birthing experience directly in the face and that both scared and excited the hell out of me. I was being pumped full of happy hormones. I was eating cupcakes without a care and craving an alarming amount of fruit. I watched entirely too much Live, Ellen, and The View. I went to the gym every day and really enjoyed the walk to and from. Every day I stopped along the way for a decaf cappuccino. I even enjoyed riding the bus whenever it got to be too hot and my feet began to swell beyond the confines of shoes. I was really happy, like unbelievably happy. I even knew it at the time. Right around the same time, I was introduced to one of the most hilarious creatures ever born. We named him Murray after Bill Murray because he was covered in stripes and he made us laugh. He was no bigger than a hamburger bun. He was small and therefore a champion hider. Every day I would walk home from the gym in anticipation of trying to find him. He had several hiding places. My personal favorite and the one behind the books on the bottom shelf of our bookshelf. It took me forever to find that one. There was also the hiding place behind the VCR, under the bed pillows, in the shoebox in my closet. There was one that was so good, we never, ever figured out where it was. Every day I looked forward to finding Murray. It was a game he and I would play. I’d come home, call on him, look for him and then he’d climb on my growing belly for some scritches. So, what happens whenever a memory doesn’t need renovation? A Super Memory is created, the God of all memories, a memory that will likely comfort me right before I say my final farewell, one lacking regret or necessary reconstruction. Those days bring me an inexplicable amount of joy. Of course, there is also a song associated with that time. This isn’t something you’ll hear on the radio. In fact, only three people have ever heard it. Ever. Every day on my way home from the gym, I’d sing a song in anticipation of seeing the creature I once referred to as “My Little Person”. He is a furry man. I love my Murray Man. What I’m trying to say is this: on this day last year, I was about to say goodbye to one of the kindest creatures I’ve ever known. I was nearing a time that would bring with it an inexplicable degree of sadness. But unbeknownst to me then was that right as that time was coming to and end, a time that would hurt so badly no amount of renovation could ever fix it, another section of my life was about to begin, a really happy time, one that wouldn’t need any work done to it at all. Next Post 8 Months Old! That was a beautiful tribute. I remember the picture you posted, oh, ages ago, of Murray scritches. Him up on your belly, butting heads with you, both of you looking totally blissed out. That pic makes me happy. 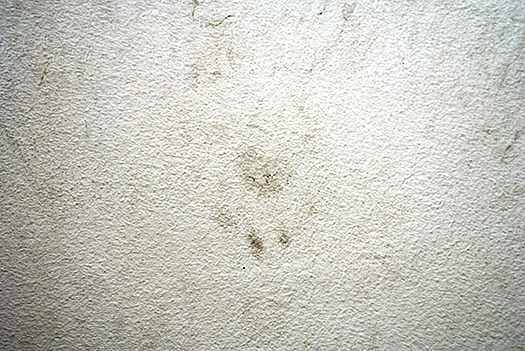 Have you thought about cutting out that portion of the wall (with the pawprint) and framing it for your own home? You could likely do it with a router, and stuff like that is easy to ‘repair’… matching the paint would be pretty simple too. Would probably cost < $100 to remove, fix and frame. Yeah, I kind of joked about the idea about taking his print with me, but I never thought it’d be possible. Is it really a possibility? assuming your wall is drywall…. to fix, you put a few back-braces in the hole, put a smaller shaped replacement in there, and fill in with joint compound / spackle. then sand and paint. Just under three weeks ago, my beloved cat Jose died of kidney failure. He and I had been through a lot together over the years, including a move from the West coast to the East…he handled it like a champ. This post really brought me “up” and simply put, touched my heart. Thanks for sharing! Schmitty’s cat soul will move with you. I love the idea of taking the paw print with you. I’ve had cats all my life, and while I’ve loved each one for his or her own personality, there are always the special ones. My Nermal raised me from my mid 20’s to my early 40’s. At 18 and a half I had to let her go due to illness. My heart still misses her 4 years later. Not but a month after she was gone, I met a wee kitten who had a rough start at life, broken leg, not enough food to eat and etc. While a part of me said it will take time to find another cat. That day about a month from the day Nermal died, I held my wee Mary McDhui (yes she has two names) :-). I fell in love. Much like your Murray – she makes me laugh and God willing, she’ll take me into my 60’s. So when she wants to play fetch,yes she plays fetch, I am still amused. I love finding cat toys in my bed, as if she put them there just for me. Mostly, she gets me. Like Nermal, Mary McD thinks she is person or I am cat. Not sure which. And sometimes, she does this hop and then a head rub against my leg, just like Nermal used to do. Thank you for sharing Murray with us. Oh, finiky, thank you for that story. You brought tears to my eyes. Thank you. Oh this brings it all back. But just like with you, a month after having to say goodbye to my first cat Marley, a couple little funny guys graced my door and they make me laugh all the damn time.